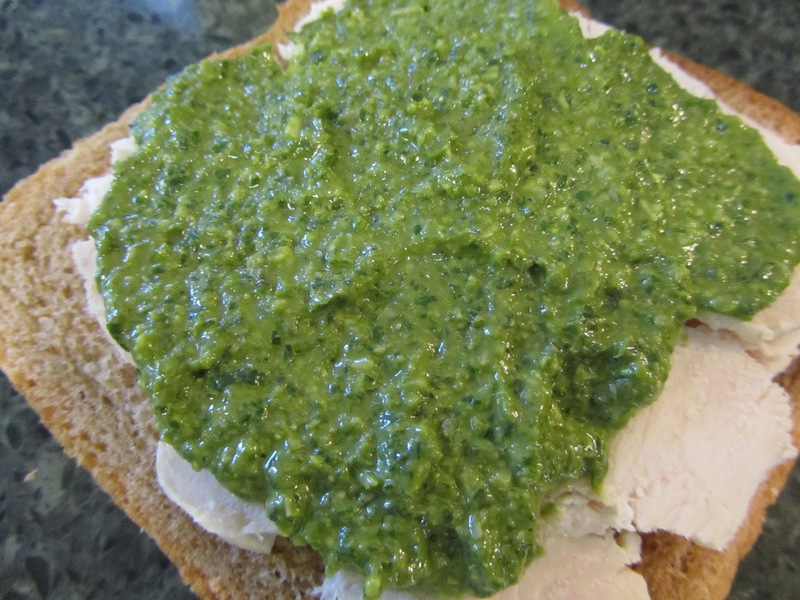 Another specialty food I like to make in summer is pesto. You can buy cheap pesto in the supermarket, the kind that comes in jars, priced around $3 for 6-8 ounces. But if you check the label, the ingredient list contains ingredients other than the basic basil leaves, olive oil, Parmesan cheese, pine nuts, salt and pepper that you find in a recipe for this condiment. And if you read the reviews you'll find that the flavor can be very "off" on some of the jarred brands. You can also buy "fresh" pesto, the kind that comes in a plastic tub and must be kept refrigerated. Those are good, and in checking the ingredient list, the manufacturers stick to the basic pesto recipe. But they cost about $5 for a 6-oz plastic tub. 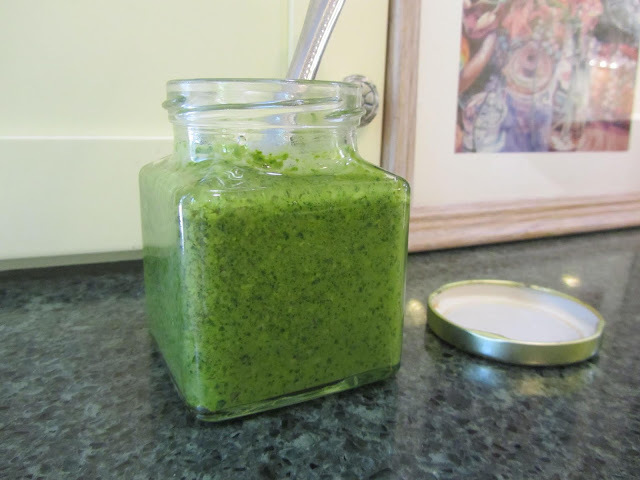 Pesto is super easy to make, and if you grow your own basil, and shop carefully for the other ingredients you can make a batch for about half of the supermarket price, in about 5 minutes (including washing the basil leaves), using a food processor. pine nuts -- I use about half the recommended amount because I don't like a super strong pine nut flavor. I like to just barely detect the pine nuts. You can buy pine nuts in bulk bins at some stores, for around $20/lb. That sounds like highway robbery, I know. If you go light on the pine nuts (like I do), you can get by with about a dollar's worth to make a batch of pesto. The the price does not seem so terrible, for the authentic pine nut pesto. (You can also buy pine nuts through Amazon in an 8-oz packet for about $10. Pine nuts freeze very well, and since their flavor is so distinct, in our house, at least, they're not likely to get snacked on.) For more frugal pesto, almonds and/or walnuts are also good a choice and about 1/3 of the price of pine nuts. In fact, almonds are my "usual" nut for pesto. olive oil --most recipes call for extra virgin olive oil. I use a blend of 3 parts olive oil to 1 part regular vegetable oil. I do this so that the pesto remains spreadable when refrigerated. But it also holds the cost down a bit. In addition, I use about 2/3 the amount of oil in the recipe, for a less oily condiment, and that also brings my cost down. I've been buying olive oil in the bulk section of WinCo. They have dispensers for a few liquid items, such as honey, olive oil, and agave syrup. It's a good price and I can buy however much I need. Parmesan cheese -- I wait until I find a good sale, buy from bulk bins at WinCo, or I buy a large bag at Cash & Carry. The bulk bin kind of Parmesan is the powdery kind and not as good, IMO, as the fresh shreds. Fred Meyer had a coupon last week for 50 cents off Kroger brand Parmesan. The coupon combined with my Senior discount made the price reasonable-enough. I have also subbed some mozzarella for about half of the Parmesan, before, and still had a very delicious result. basil -- if I didn't grown my own basil, I wouldn't buy fresh basil for the purpose of making pesto. There are alternative greens which can be used, but the basil flavor will not be there. I know someone who makes pesto with a variety of greens, and they enjoy it immensely. I do have basil in large pots on my deck, and there are more leaves that we can eat, unless I make pesto. garlic -- for ease and price, I use dried garlic granules, bought in a bag in the Hispanic section. It's good, and super easy to use. So, all totaled, the batch of authentic pesto that I made the other day (loosely following Ina Garten's recipe) using about half of the pine nuts, and no walnuts (allergy), not the full amount of oil, and in a 3:1 olive oil (from WinCo)/ vegetable oil ratio, Parmesan shreds bought on sale, with coupon, and with discount, garden basil, garlic granules, and some salt, I figured my 6-oz batch cost about $2.50, or about half the price of commercial fresh pesto. 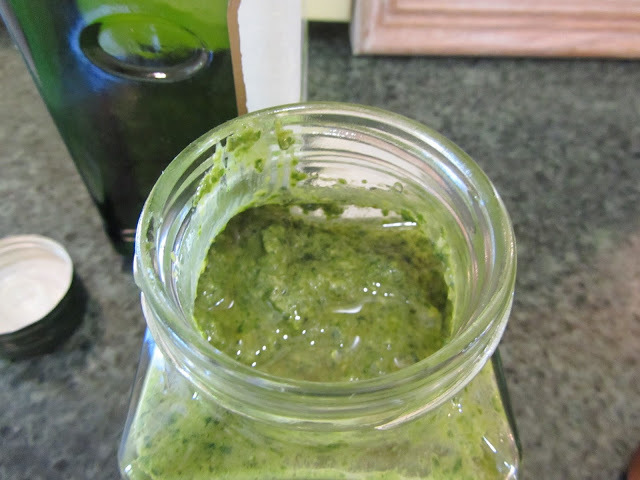 A tip for keeping fresh pesto -- basil leaves oxidize and turn a very un-pretty brownish green. After each use, shake the contents down to level the top surface, then drizzle with a bit of oil and tilt the jar around a bit to coat the entire top surface of the pesto. When you use it again, stir the oil into the pesto first. Then after use, top with a bit of oil, again, as before. Kept refrigerated, pesto will last about a week. It can be frozen for about four months. Making pesto has been on my To Do list for a while now since my basil is growing well. Maybe this will inspire me to do it. I will probably use almonds because we have some of those. I use almonds most of the time, and we like that just as well as pine nuts. I think you will, too. Have you ever tried pesto pizza? A friend on facebook mentioned she loves that. I'm going to have to try it this summer. No, I haven't tried pesto pizza, but it does sound good. Thank you for the reminder - I wanted to make pesto with my basil before I head back to my job at school next week! I have made pesto pizza - so good! I topped it with sun dried tomatoes and mozzarella cheese.